Binny sandstone comes from Uphall, West Lothian which had been quarried since 1794, it was transported from 1822 by the Union Canal, and by railway from 1842. It is pale yellowish brown, medium grained rock and comes from the Lower Carboniferous geological period. Other prominent buildings in Edinburgh made from Binny stone are: the Former General Post Office, East End of Princes Street (1866), Donaldson’s School for the Deaf (1851), West Coates and the statue of Queen Victoria on the Royal Scottish Academy (1844) by Sir John Steell. It has been described as a very nice material, probably not quite so durable as Craigleith but less costly to work and of better colour; for ornamental carving it is particularly good. The following images are taken from a Scanning Electron Microscope showing the Binny sandstone magnified several thousands times. The large structures are quartz (silicon dioxide) or sand, the smaller whiter ones are Kaolinite or clay which acts as a ‘cement’. 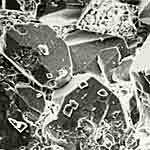 Image 2 shows how the Kaolinite clay binds together the quartz crystals. 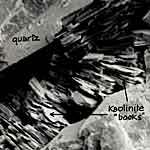 Quartz mineral crystals with flat faces and edges and are bound together with a matrix of clay, Kaolinite (this looks like loosely stacked hexagonal crystal plates or ‘books’). Image 3 shows the Binny sandstone with a heavily soiled surface. The large structures are quartz crystals or sand with a build-up of ‘particulates’ (particles of soot and dirt) on the surface obscuring the naturally clean and smooth crystal quartz. Image 4 shows the sandstone with only light soiling, as indicated by the clean surfaces with only little particulate matter attached. The large structures are quartz or sand crystals with smaller particles of soot and dirt on the surface, allowing the naturally clean and smooth crystal quartz to be seen. Compare this with the previous image. This image, about one millemetre wide, of the Binny sandstone, shows the composition of the stone containing mostly quartz, mica, and siderite (natural ferrous carbonate) goethite, another iron compound, with much of the kaolinite (china clay) ‘cement’ having been washed out from between the grains, thereby weakening the structure. A weak area with gaps can be seen running along beneath the top layer of quartz. This potentially would allow the surface to flake off. The particles of quartz are coated with shale-oil which is displaced when preparing the slide. The oil has contributed to the soiling of the monument by helping soot and grime attach to the stone. A ‘thin-section’ photomicrograph of stone is achieved by thinning down a section of a drilled core, then mounted using blue stained epoxy resin onto a microscope slide. 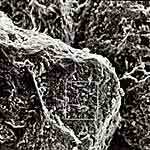 This image shows the quartz crystals at about 150 to 200 microns ie 0.15 to 0.2 mm.